Massive flooding caused by Tropical Storm Harvey along Texas' refinery-rich coast could have far-reaching consequences for the state's oil and gas industry and the larger U.S. economy — potentially sending gasoline prices up by as much as 25 cents per gallon, experts say. The storm's remnants left much of Houston underwater on Sunday, and the National Weather Service says it's not over yet: Some parts of Houston and its suburbs could end up with as much as 50 inches — more than 4 feet — of rain. With the heavy precipitation expected to last for days, it's still unclear how bad the damage will be, but there is already evidence of widespread losses. Key oil and gas facilities along the Texas Gulf Coast have temporarily shut down, and flooding in the Houston and Beaumont areas could seriously pinch gasoline supplies. Companies operating in the Gulf of Mexico have evacuated drilling platforms and rigs, crimping the flow of oil and gas. Harvey's toll on air travel in the United States is set to extend into Monday, with the tracking service FlightAware.com reporting that more than 1,400 arrivals and departures already have been canceled. That's in addition to more than 2,000 that were canceled over the weekend. Economy watchers were looking to oil futures markets Sunday night and stock trading in the United States on Monday morning for further indications of fallout. Nearly a third of U.S. refining capacity sits in low-lying areas along the coast from Corpus Christi, Texas, to Lake Charles, Louisiana. Beyond the shutdown of refineries at risk of a direct strike from high winds, there's the threat of flooding and potential power outages for gasoline supplies. Refinery outages continued to spread Sunday, with about 2.2 million barrels per day of refining capacity down or being brought down, according to analysts at S&P Global. 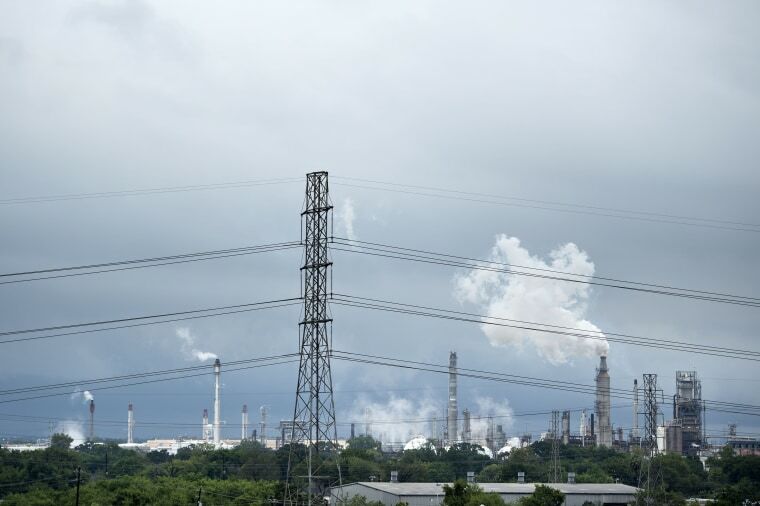 Valero Energy Corp., whose two big Corpus Christi refineries escaped damage, said it was working with state and federal agencies and its business partners to determine what infrastructure was needed to resume refinery operations. Even before Harvey hit, the prospect of supply disruptions sent gasoline futures to $1.74 a gallon, their highest since April, before they retreated to around $1.67 by Friday afternoon. At the pump, experts see gasoline increasing by 10 cents to 25 cents a gallon. Given the strictures faced by the refineries, "this is the dominoes starting to fall," Patrick DeHaan, senior petroleum analyst for Gas Buddy, said Sunday. "This is sort of slowly turning out to be the worst-case scenario." Companies have evacuated workers from oil platforms in the Gulf of Mexico. The U.S. Bureau of Safety and Environmental Enforcement said Sunday that workers had been removed from 105 of the 737 manned platforms used to pump oil and gas from beneath the Gulf. The agency estimated that platforms accounting for 22 percent of oil production and 26 percent of natural gas output in the Gulf had been shut down. "After the storm has passed, facilities will be inspected," the agency said in a news release. "Once all standard checks have been completed, production from undamaged facilities will be brought back on line immediately. Facilities sustaining damage may take longer to bring back on line." The shipping industry also is expected to be disrupted by the worst hurricane to hit the Texas coast in more than 50 years. Shipping terminals along the coast shut down as the storm approached. Port operations in Corpus Christi and Galveston closed, and the Port of Houston said container terminals and general cargo facilities closed around midday Friday. Rates increased for carrying freight between the Gulf and the East Coast. More than 1,400 flight cancellations are reported for Monday, according to FlightAware. Houston's two airports were closed to all flights except those connected to relief efforts. Houston Bush Intercontinental Airport was not expected to reopen Monday until noon at the earliest. Houston International Airport was scheduled to remain closed until Wednesday morning. Airlines were offering customers the chance to reschedule trips that would take them to Houston, San Antonio or Austin from Friday through the weekend. Researchers at Texas A&M University estimated that the storm would knock out power for at least 1.25 million people in Texas. They said the hardest-hit areas would include Corpus Christi, which is on the coast, and San Antonio, which is about 140 miles inland. Risk Management Solutions Inc., which does forecasts for insurance companies, expects wind-damage claims in the low billions of dollars, possibly reaching as high as $6 billion. The company said storm surges and inland flooding could be even bigger sources of losses. If the firm is correct, that would put homeowners and the government-backed National Flood Insurance Program at risk. The flood program is run by the Federal Emergency Management Agency, which owes the Treasury about $23 billion it borrowed to cover past disasters, according to a recent report by the U.S. Government Accountability Office. Homeowner policies offered by insurance companies typically don't cover flood damage, but a relatively small percentage of homeowners have flood insurance through the federal program. Property data firm CoreLogic estimated that insured losses for home and commercial properties, as of Friday, would be $1 billion to $2 billion from wind and storm-surge damage.